Pillows are usually made of various fill types such as downs and feathers. These fill types create a fluffy, lightweight volume that comfortably supports the head and neck. However, they can also sometimes trigger allergies, causing the user to sniff all night. Fortunately, the best hypoallergenic pillows have become more available in stores and online shops today. Hypoallergenic pillows are made of three different fill types. The synthetic fills, such as polyester, are hypoallergenic and provide excellent support. The down alternative fills are either natural fibers or synthetic and are similar to the rich loft of down fillers. The memory foam is a sponge-like material that contours to the head and neck for support. Among the wide selection of hypoallergenic pillows today, there are three pillows that stand out in the market, and we are here to talk about each of these three in details. In Style Furnishings is a popular manufacturer of premium beds, furnishings, and bedding accessories. One of its outstanding products is this Gel Fiber Bed Pillow, which boasts a five-star hotel quality and comfort. The In Style Furnishings Gel Fiber Bed Pillows come in queen and standard sizes. The standard size is 20 by 26 inches. It is fluffy but firm enough to support the neck and head throughout the night. The In Style Furnishings Gel Fiber Bed Pillows come packaged in two. These pillows are made in the U.S. with a quality that is similar to hotel pillows, giving you that luxurious comfort that turns your bedroom into a five-star hotel room. 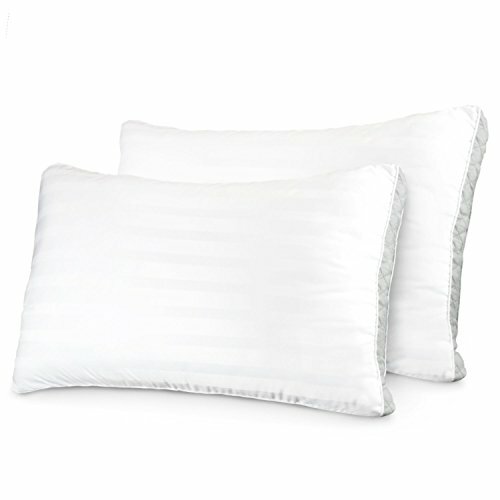 Made of rich 1.4 density gel fiber, these bed pillows provide coziness as they mold around with any sleeping position. 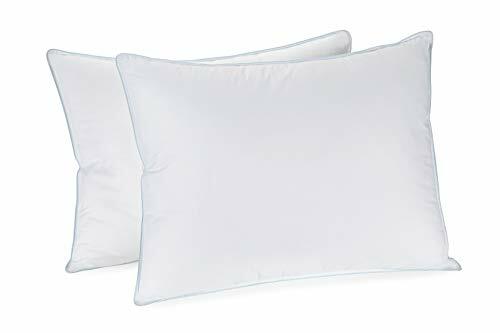 They are an excellent alternative to down pillows but are crafted to be safe and hypoallergenic. This means that they can resist molds, mildew, dust, and bacteria that can trigger allergies. The cover is made of 50% cotton and 50% Tencel. This Tencel material is eco-friendly and adds a silky, polished surface that can absorb moisture more effectively than any other materials. Its ability to absorb moisture makes it perfect to regulate body temperature, making you feel cool and dry while sleeping. Compared to most pillows, the In Style Furnishings Gel Fiber Bed Pillows are machine-washable. You can simply toss them into the washing machine and then run them on a gentle cycle on a cold water setting. Keeping them fresh and clean is a lot easier to do compared to other pillows. It is important that the pillows you buy come with a quality guarantee. With this package, no matter how expensive the pillows are, you can be sure that the manufacturer is confident in its product. The Sleep Restoration 1800 Series Gusset Gel Pillows come with this guarantee, but what are the other features they can offer? The extremely plush gel fiber filling of Sleep Restoration 1800 Series Gusset Gel Pillows provides support for a comfortable sleep. The material is of high quality and stands out among other ordinary pillows. 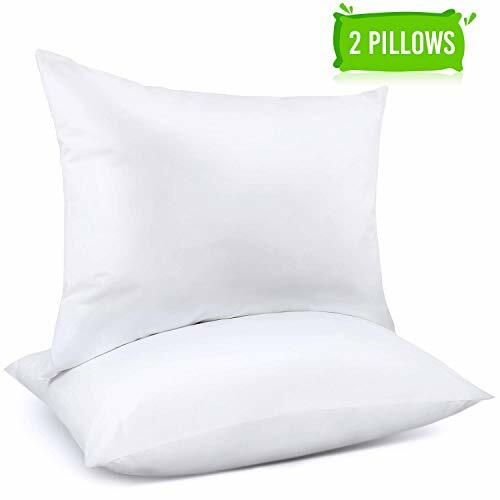 Plus, these pillows are paired with a gusseted cover, which adds structure and support for a fuller, more stable comfort in any sleeping position. As a hypoallergenic pillow, this Sleep Restoration pillow resists dust, mildew, and mites, which can cause sniffing and sneezing. Moreover, it is made of allergen- and chemical-free materials too, making it safe for users who suffer from various respiratory problems. The Sleep Restoration pillow is safe for machine wash. It doesn’t easily fade and resists stain, so it lasts for years. To add value to your purchase, the manufacturer gives a 30-day satisfaction guarantee, which means that you get a full refund if you are not pleased with the product. The Adoric Bedding Series are made with high-quality materials and technologically-equipped processes to create pillows that are not only healthy but are also comfortable to support and improve sleep. The Adoric Bed Pillows are made with the same techniques, making it hypoallergenic and comfy. The Adoric Bed Pillows is made of 100% polyester deep cluster fiber. This material is extremely comfortable, making the pillows especially ideal for back and side sleepers. That is because it protects the spine while on these sleeping positions. This filling is dense enough to provide comfort and support. What’s more is that, similar to the other bed pillows we’ve looked at, these are also hypoallergenic. This means that they can prevent dust particles and mites from getting into or staying on it. The Adoric Bed Pillows come with 100% cotton-made cover that adds softness and silkiness to the pillow. It helps absorb moisture and extremely breathable to regulate temperature. Each purchase comes with two pieces of standard-size bed pillows with dimensions of 17.9 by 12.1 by 5.7 inches. Since one-third of a person’s life is spent sleeping, it is important to invest in safe and comfortable pillows. Although there are many choices in the market, not all of them would provide you with the comfort that you need. After all, not all pillows are safe for sufferers of asthma, allergies, and other respiratory issues, so it’s necessary to know the best hypoallergenic pillows. The above-mentioned hypoallergenic pillows have one common quality: they are all resistant to dust, mite, moisture, and bacteria. However, if you are going to invest in really high-quality pillows, the In Style Furnishings Gel Fiber Bed Pillows is the best choice. These pillows may be quite expensive, but they are made of hypoallergenic materials that are comfortable and safe for every one. They come in a vacuum seal but quickly fluff out and stay fluffy for years.